The 85 flags on the ceiling of the Track Town Studio weren’t mere decoration - they helped the students collaborating beneath them gauge how and where to display flags from the countries participating in the 2014 International Association of Athletics Federation’s (IAAF) World Junior Championships. With Product Design Program and Department of Architecture students working together, Track Town Studio focused on collaboration as the students developed an integrated design package that included the flag display and a world class pavilion. “When we hung the flags in the studio, the space began to embody the international character of the event that the students are designing for,” said co-instructor Sebastian Guivernau, an architect at Portland’s ZGF Architects whose credits include helping create the Nike Camp Victory experience for the 2012 Olympic Trials in Eugene. In July, 175 countries will participate in the biannual track and field competition at Hayward Field, which will feature many athletes who will go on to compete in the 2016 Summer Olympics in Rio de Janeiro. “When this opportunity came up for the IAAF competition, it seemed like a natural fit for product design to help out [with architecture] a little bit,” said Trygve Faste, assistant professor of product design and co-instructor of the studio. Faste and Guivernau said that active teamwork from different disciplines, known as “cross-pollination,” was one of the most important lessons taught by the studio. “[This studio] reflected a more realistic picture of how collaborations happen in industry. That’s the model we have tried to replicate in the classroom,” said Guivernau. 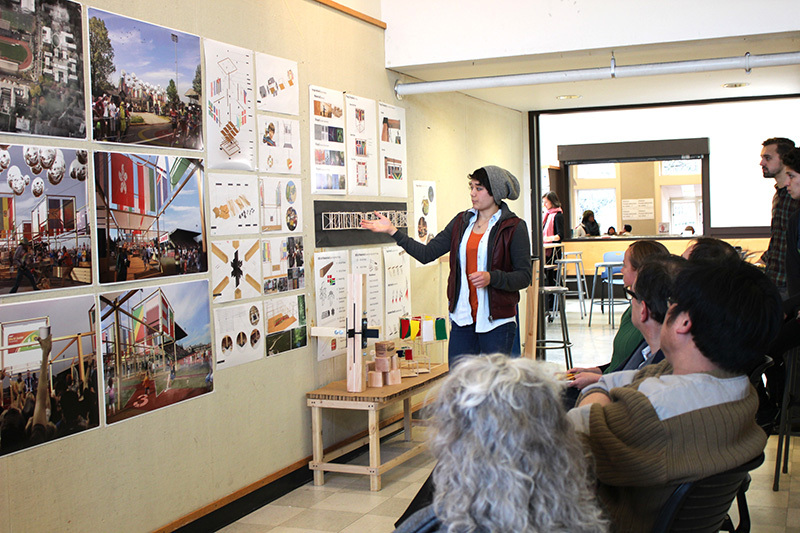 In January 2013, representatives from Track Town, an organization that hosts track and field events across the Willamette Valley, asked faculty members in the School of Architecture and Allied Arts for assistance with coordinating specific architecture and product design for the event. The merger between the Product Design Program and Department of Architecture was approved in mid-August, just before fall term. Students divided into groups of four, each consisting of two product design students and two architecture students. The product design students were primarily concerned with developing the flag display, which will be exhibited in or around the perimeter of Hayward Field. The architecture students developed concepts for spaces and structures for the IAAF event. The pavilion concepts, which must represent the community of Eugene, included personalized locations for food vendors and information kiosks. Groups approached their projects differently – some explored Eugene’s cross country and track communities, others emphasized historic Hayward Field and its track athletes and another focused on the Pacific Northwest with a lumber-themed structure. Students received productive feedback from industry leaders and field experts that helped tailor the projects to the client’s vision. During review week, representatives from AHM Branding, the agency hired by Track Town to craft the event’s identity; Gallagher Designs, a design agency that collaborated on the Hatfield-Dowlin Complex; and Track Town critiqued each team’s concept, which may influence the World Junior Championships.